This brilliant piece of art, a recent miniature rendered using most accomplished form of the early 19th century idiom of Pahari art style, represents ten Devi forms proceeding to annihilate hordes of demons and Shumbha and Nishumbha, their leaders. The painting illustrates the Shumbha and Nishumbha part of the third Episode of the Devi-Mahatmya. The episode is later repeated almost unchanged also in the Devi-Bhagavata Purana and Varaha Purana. The National Museum, New Delhi has in its collection an exactly identical miniature of circa 1800-10 probably from Kangra. As magnificent a work of art as its earlier version, this painting enables the eye to re-visit one of the most glorious phases of Indian art. Unique in its narrative thrust and illustrative merit, the painting glows with a rich variety of colours. In the beauty of landscape, simple but pulsating with life, and in perspective the painting is outstanding. Not merely for stylising, or for establishing identities of various goddesses, the painting portrays elephant, bulls, lion, peacock, swan and Garuda, as participants in the campaign. On their faces reflects same determination as on their mistresses'. With them and those of the goddesses on foot the entire landscape appears to be moving. As the third episode in the Devi-Mahatmya has it, ages of battling passed but gods weren't able to annihilate demons Shumbha and Nishumbha and regain from them Baikuntha, their abode, and their lost position. One day, it was revealed that they could never defeat and kill Shumbha and Nishumbha as under a boon no male  born or unborn, could kill them. With no option left gods decided to create a female form  a mighty warrior capable of annihilating Shumbha and Nishumbha, out of their energies and with all their attributes. This form, created by combined energies of all gods, emerged as Devi. Superior to any god individually, they all paid her homage and sought help in annihilating Shumbha and Nishumbha. Devi undertook the job and battled against them but with hardly any result. Gods, watching the battle from sidelines, felt that Devi, unless she was assisted, would not be able to annihilate Shumbha and Nishumbha and their hordes. Expedient as it was, each of the gods created out of his own Shakti  power, his individual female counterpart for assisting the Devi in her battle against demons. Accordingly, Brahma created out of him Brahmani, Shiva as Mahesh, Maheshvari, Karttikeya, gods' commander, Karttikeyi or Kaumari, Vishnu, Vaishnavi, Vishnu as Varaha, Varahi, Vishnu as Narasimha, Narasimhi, and Indra, Indrani. Subsequently, these seven Shaktis were identified as Saptamatrikas, seven mothers. In Devi's battle against Shumbha and Nishumbha, besides these Saptamatrikas, she was also assisted by Kali as Chamunda, and Shivaduti, whom Devi created herself out of her own Shakti. 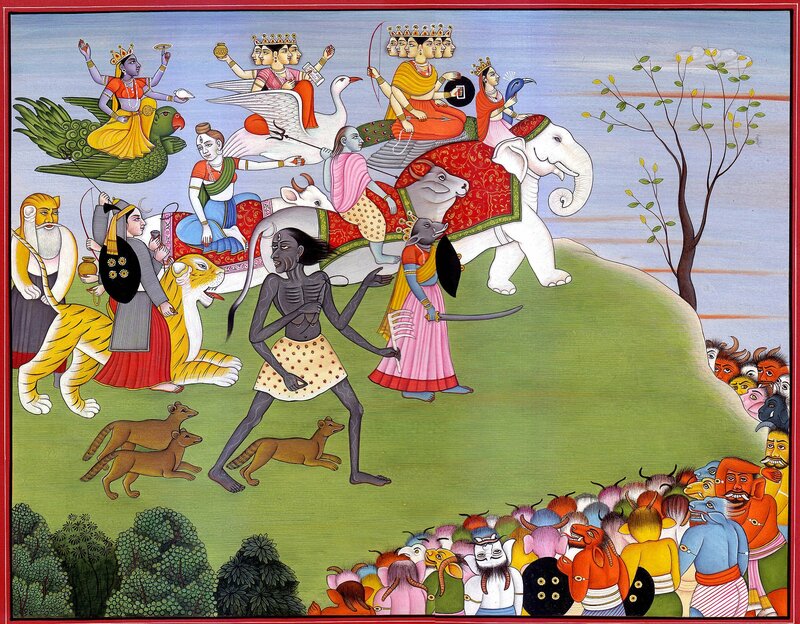 The painting portrays ten Devi forms, Saptamatrikas seven mothers, and Shivaduti, Kali as Chamunda and Devi herself, as marching towards the army of demons positioned facing them. Except Varahi, Chamunda and Narasimhi who are on foot all other goddesses are on their own mounts or on those of their spouses - Kaumari on peacock, Brahmani on swan, and Vaishnavi on Garuda, Indrani or Aindri on elephant Airavata, Maheshvari and Shivaduti on bulls, and Devi herself on lion. Almost like modern defence management, this army of goddesses has been divided into three columns : the upper one comprising Kaumari, Brahmani and Vaishnavi, all on vehicles capable to fly, covers the space above; the central one comprising Indrani, Maheshvari and Shivaduti covers the earth part; and, the lower one comprising Varahi, Chamunda, Devi herself and Narasimhi covers, though symbolically, the nether world. Chamunda has her dogs following her.